Snowden passed away on 5 Dec 2015 and is survived by his wife Geraldine, sons Mark and Michael and five grandchildren. You have to wonder who thought this was a good idea. 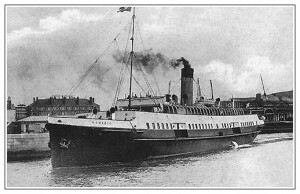 The people running SS Nomadic, the former tender for White Star line that ferried passengers to that ship in 1912, were going to have a “Bring Your Own Alcohol Beatnomadic” club night. The tender is the last surviving ship of the White Star Line, over 100 years old, and cost more than £7 million to restore. When word got out via social media that this event was going to take place, it sparked outrage. The Belfast Telegraph reported that several members of the Nomadic Charitable Trust threatened to resign. Additionally the volunteer group Nomadic Preservation Society (who helped raise money to restore and purchase artifacts for the ship), received phone calls inquiring how such a party would do to the old ship. The rave was cancelled due to public outcry. And the person or persons who thought it was a good idea ought to get the sack. It would be one thing if they have a tasteful event (like a small party for donors etc) but rave parties are known to be loud, brash, and full of people dancing and drinking away. Hardly a fitting place for that sort of thing. Did they not realize such a party would enrage the Titanic community? Whatever passes for brains in those associated with this dumb decision ought to have their heads examined for possible brain injury.